3. But that doesn't match anything I own... Oh, now I see where this is going. 4. I prefer my bicycles to be naked, the way nature intended them to be, but thank you. A photo of me in glasses that I can actually tolerate! OF COURSE I staffed the San Francisco Bicycle Coalition's annual Winterfest fundraiser and party. How could I not? Thanks for finding this, Larry! 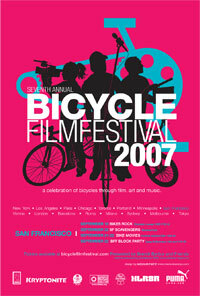 Bicycle Film Festival in San Francisco This Week!!! I am so excited!! Another Fabulous Bike To Work Day! 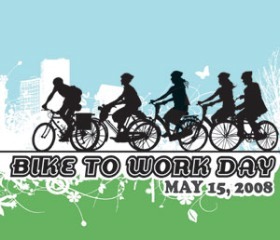 This year, Bike To Work Day fell on May 15th, the anniversary of my spectacular bike wreck and emergency room visit. Last year, I had been rather humiliated to break my arm so very thoroughly during Bike To Work Week (of all weeks! ), and had to have Steven call the coalition up to explain that I wouldn't be able to staff my shift at City College because, um, well, I was in the hospital. Man, that was embarrassing. But now, on the exact anniversary of my harsh encounter with streetcar tracks and pavement, I finally got to staff a gloriously sunny and fun BTWD Energizer Station on the City College Campus. Bike people are awesome. And the weather was... exotically hot. There were twice as many bicycles as cars headed downtown on Market Street for Thursday's Bike to Work Day morning. City counts showed that bicyclists made up 64% of the eastbound traffic, while motorists comprised 32% — a nearly 31% increase in bikes over last year's Bike to Work Day counts. I chatted with a fellow Green, and we considered going up to the Castro to join in any celebrations in honor of the California Supreme Court issuing a decision in favor of marriage for everyone equally, but I got tired and went home to bed. It was just too hot to remain upright. Summary: it was fun, and bike people rock. Those of you who knew me before the days of the WWW know that I wasn't much for sleeping. It's not that I don't LOVE sleep with a remarkable intensity; it's not that I don't fantasize about sleep during some of my working hours... I'm just not very good at it. I was not good at sleeping as a child (when I had the flavor of insomnia in which I failed to fall asleep at appropriate times) and as an adult (when I fail to remain asleep through some convenient period of time, such as "night"). I discovered a cure for this: bicycle riding, and especially bicycle riding to and from work. Bicycle riding has become a great passion of mine for many, many reasons: one of those reasons is that it allows me to experience blissful, deep, profound states of sleep. Alas and alack, since... what are we calling it. The Incident? My unfortunate encounter with the earth? My passionate, uncontrolled bonding with streetcar tracks? A day that will live in cycling infamy? Anyway, since I "shattered" my arm last year and went through my subsequent surgery and multi-month recovery period, cycling has had a different flavor for me. (No, not blood. Not vicodin, either.) It is still something I love, but now it is tinged with fear, and I weigh the risks of making a trip differently than I used to. As a big-city urban person, just about all encounters with the outside world are fraught with peril and risk: the risk of standing near someone who smells bad, the risk of seeing a really good foreign film that you'll be boring your entire peer group with for ages, the risk of being killed while crossing the street on a green light by a person in an SUV having a conversation so inane that they will be ashamed to describe it to the police ("It involved a sale at Lowe's, a bag of cat litter, and jug wine..."), the eternal threat of discovering a completely addictive coffee place, or seeing a good art show, or hearing a really stupid argument... Death is on that list, of course, as it is anywhere, indoors or out. Having my bike stolen due to improper locking or foolishly leaving it anywhere in the greater Civic Center region was always on that list. But doing something that might cause me months of pain is a new item that has me re-evaluate all sorts of things, and not just biking. Under my new risk evaluation scenario, I find myself unwilling to bike places that are not inherently fun. So, for example, my bike ride to work at my company's offices to Emeryville are fun-deprived. No matter which of the three main routes I choose (and I usually choose the longest to get in the most biking), I'm never really wallowing in the sort of pleasure I get from biking in the City. I don't really enjoy the one mile bike ride to BART here in SF: although the street is now buttery smooth on the BART-bound side due to some water main work, it's just a mile. I don't even warm up. And I have to bike past (and cross) the spot where I crashed each time. I don't really enjoy the ride from West Oakland BART to Emeryville. I like MLK drive, with its landscaping and odd mix of Victorian buildings and what appear to be steel mills, and I like hearing the geese flying overhead and honking... But I nearly always bike there alone. Or with big rigs that want to make right turns through me. I have to cross all those tracks, and the sewage treatment plant imbues several long blocks with an aroma that defies pleasant characterization. Yes, I love the morning light. But it's just three miles! By the time I pass Semifreddi's and smell the garlic bread, I'm just warmed up, and the ride is nearly over. Biking in the City is such a reward in and of itself, and I love being here so much... My Oakland commute just isn't the same. It's about 8 miles round trip, but in such awkward little increments (1 mile, 3, 3, and 1)... It's just not satisfying. And it's something of a relief to figure this out, because I thought that I was unmotivated because of a fear about biking, when really it's that biking where I happen to bike in Oakland isn't much fun, and especially isn't much fun alone. Recent bike-related dream 1: cruising down Market Street from the top of Portola, I am doing an easy 40 mph (with moderate break riding) as I approach Castro Street. There are streetcar tracks at Castro, where the F turns around. I see them, I consider my speed, and I cannot figure out how to avoid having a crash. I begin to turn to hit the turn in the tracks completely perpendicular, but that will launch me into a curb and then a planter. I begin to panic. I wake up. Recent bike-related dream 2: Jack Black, acting like many of his characters, has a shop on 29th Street near Mission where he tricks out bikes. His custom jobs are wild, funny looking, and often completely impractical, involving a tall bike with high handlebars with its wheels resting in a contraption that puts the power into small, toy-truck skates at the bottom, for example. Indian Summer in San Francisco. I love this time of year: the closest thing that San Francisco gets to conventional "summer." The days are sunny and warm; the nights are warm and clear. The heat makes the City's lights seem to twinkle even more than usual. Oh, how I love San Francisco. Monday night, after a full day of working in Eville (still pronounced like "evil"), I decided to bike around the northern shore of the City. I hopped off BART at Embarcadero Station and headed for the Ferry Building. (Within two or three minutes, I encountered more cyclists in that one block walk than I had in all of Eville and Oakland on my way out.) I rolled onto the Embarcadero, our shoreline road, and cycled north and west, along the edge of town with small packs of other bicyclists. The air smelled clean; the sky was still bright; and everything about the City seemed relentlessly gorgeous. and into the Ingleside where I live on my big, steep hill. There were bicyclists like me everywhere, cruising along the shore, rolling along the dark Presidio roads with their LED headlights glowing, gliding along through the streets of the Richmond... It was too beautiful to stay indoors, too beautiful to sit in a noisy car, too beautiful not to get out and FEEL it. This is what I have been missing, and it is mine again. You know I love bicycling, nearly as much as I love food, so it's not to surprising that I love Brendt Babur's Bicycle Film Festival. A bunch of fanatical amateur film makers crank out movies about their bike love, and that love is great to behold. Brendt has done a remarkable job of making the festival international - it now goes to 16 cities around the world - though American culture and views (including views of other cultures) dominates. His speech last year was especially moving - I love the idea that the worldwide bicycle movement(s) are really having a positive impact, and that we'll look back on these days and be happy to have taken part in something that has influenced the way so many people live and think about living. Bicycle Film Festival 2007 (bicyclefilmfestival.com) came to San Francisco this week, and it was the happy scene it usually is - and the first autumn rain on Saturday morning didn't last long enough to ruin the small street festival associated with the event. Bicycles were valet parked all the way down the block on 16th between Mission and Capp streets, and there were throngs of people wearing messenger bags and carrying helmets everywhere you looked. The film festival is changing over time, or perhaps my view of it is changing. There is an established bicycle culture here with many, many subcultures, and since we're the target audience and accept bike culture as fact, the films included for us are less general ('this is what biking is about') and more compartmentalized ('this is what this particular zip code is doing'). The festival is now full of films just about one particular racing subculture, or just about mountain biking, or just about one neighborhood... This is surely a natural evolution, but perhaps I still hunger for wide cultural images of what 'the movement' is like. This year I watched two of the seven programs. Program 5 consisted of 4 films. Revolutions Per Minute shows foldies being manufactured by Brompton in their facility in England. Eat! Sleep? Bikes! was my favorite selection within this set: it's the story of a 4-person team relay riding the Furnace Creek 508 - a 508 mile, brutal endurance ride through Death Valley, featuring extreme temperatures and thousands of feet of climbing. This all-vegan team rode the entire event on fixed gear bikes!!! They deserve admiration, wonder, and perhaps some psychological counseling, but they did it - and came in ahead of dozens of teams who rode multi-geared bikes, all while raising money for Bonobos, who are 'the most vegan of primates.' Which is super-cool. We Just Work Here is a long, artsy film showing the employees of Santa Cruz Bicycles drinking cheap beer and tearing down trails. There are color sequences, there are many black and white sequences with very deep, rich blacks, there are lots of... men. Juli Furtado works there, and they had a little clip of her, but it was a warm-up for the boy-heavy program 7, and a reminder that boys outnumber gals in the biking world in significant numbers. This film was lovingly made, but I understood the woman in the row behind me saying it was about 20 minutes too long. After dinner at Ramblas (reviewed below) and a stop at a fine, locally owned bookstore, we watched Program 7, which is the messenger program. I haven't gone to the messenger program in the past, and I was expecting... something different. Something more serious, I think. The kids in the theater near me weren't messengers, but were young, drunk, high, and got really excited that they could read text on the screen out loud, which they did at every opportunity. The fanciest films in the series were about boys who travel internationally and bike recklessly - driving against highly busy traffic on one-way streets in New York, for example, between multiple lanes (i.e. some are between lanes 2 and 3, others between 3 and 4). That isn't my bike culture, and I was put off by it's maleness, whiteness, and by a racer (male but not white, wheee) admitting to having 30 or 40 bikes of his own - it seemed just another American-materialistic-boy fad, which was disappointing. But it is there, and I learned some things about it. Ski Boys, the film that set the tone for the program, featuring boys jumping off barns into sacks of leaves and old mattresses, or putting on winged costumes from which to try to fly while jumping their bike off a ramp into a pond. The audience went completely wild, demonstrating that the film was aligned perfectly with the audience. On the Board: Freecall Messengers in San Francisco, which I liked mostly because I've seen those messengers around, and they kept biking past places I know very well. Track Kaiju, about the "World Champion Fixie King" showing up to race in an alleycat in snowy, icy NYC. I caught a fleeting glimpse of female cyclists at the beginning of the alleycat! This film made me wonder if biking on a fixie would be a more sensible choice in snow and ice than a multi-gear bike, at least with respect to braking. To the extent breaking is possible when the road is wet and frozen. Lucas Brunelle Worldwide Broadcast. This was the film that made me choose the messenger program; it turns out that it's also the film that made me flinch openly the most, being as sensitive as I am to the idea of falling in my current post-streetcar track-wreck-ulna-reconstruction world view. Racing in traffic; skitching in traffic; riding the wrong way in traffic; crashing; nearly being hit by cars; crashing hard on streetcar tracks... Ouch, ouch, ouch, [flinch] ouch. (Lucas Brunelle's other videos (digave.com/videos/) supply similar footage, plus mellower films of exploring the Big Dig before it opened to cars and biking on the frozen Charles River.) It was well filmed, but I suffered over it quite a bit. This program made me think of my long-time cyclist friend (who is white and male) who disapproves of fixie-riders in general for their recklessness: that recklessness was the THEME of the program. One of the scenes that sticks with me is of cyclists entering an intersection on an intersecting course with a turning car: the car slammed on its breaks just in time, and all the snow that had rested on its roof and hood hit the ground near where a cyclist had passed. That inspired hysterical joy in the stoned boy in front of me, but it only made me sigh with relief that no one got killed. I would still love to ride a fixie in a velodrome, just to feel what that is like, and I still like the remarkable elegance and simplicity of fixies (also known as track bikes), but I'll stick to my own bike love, which is completely non-competitive and is about having a slow, easy-going relationship with the City I love. Today, after more than three months of waiting, I made my intermodal commute as a bike-train-bike ride. It's only my third bike ride since... the Incident. I've been dreaming about biking since shortly after I broke my arm in my spectacular fall back in mid-May. My biking dreams have had such an epic quality: vivid; super-saturated with golden, evening light; scenic; peaceful; happy... Over and over again I've biked in my dreams, in the rolling hills of the Amador Valley, or along the Embarcadero on a warm evening, only to wake up and find that biking wasn't possible because of my arm brace, my weak arm within it, or my new, profound phobia of falling. As the weeks passed, I started dreaming about riding my new folding bike (shown in images here, folded and unfolded), the bike I crashed on, and not just my beloved road bike. (Until I dreamt of riding it, I hadn't realized that my foldie hadn't appeared in ANY dreams while I was healing.) 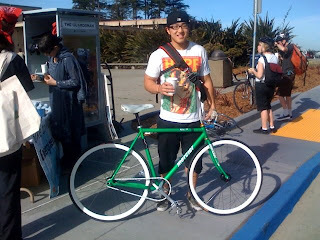 One night I dreamt that I rode my folding bike to the Presidio to meet friends from the Bike Coalition. We agreed to ride a tandem down into a dusty ravine and up the other side to get to our destination. I folded my bike, strapped it onto my back, hopped on to the third seat on a mountain bike tandem, and we flew over the lip - down into the ravine, bushes whipping past on either side, the edges of the trail only visible around the whipping hair of the girl ahead of me - and I was completely fearless. My first bike ride was 3 months and 4 days or so after the fall. I decided to ride my foldie to get past my association with falling from it. Steven persuaded me to just take a few loops around the ex-horse race track in the neighborhood, which is now a street that makes a nearly perfect, nearly flat, oval loop through expensive homes. I thought he was being ridiculous - I wanted to go on a REAL ride - but he wouldn't take me anywhere else, and I wanted to avoid traffic, so I gave in. It was terrifying. My first mistake was biking down my steep hill, which I somehow had failed to notice is remarkably steep and scary. (All these years!!) And the balance on my foldie, with its little wheels, is much trickier than I thought. I must have actually had TALENT to ride it with the ease that I did within moments of testing it out at the shop!! After surviving my own block and the gently sloped block below it, gripping the handlebars for dear life and riding the breaks all the way, I biked about 4.5 miles around the gentle neighborhood loop, but didn't feel much more confident than I had before I started. Biking was... hard?!? I waited a week, and then had Steven drive me (!!!) to Lake Merced, where I did two loops on the street with the cars, trying to beat my fear of speed and concerns about traffic simultaneously. 10 miles of having my feel clipped confidently to the pedals, with the comfortable balance that comes with large wheels, I felt a lot better about the whole idea. But I waited until today to bike to the train station via the same route that I crashed on. I biked through the same intersection I bit it in, though I took a different approach to crossing the 3.5 sets of tracks this time. And, unlike nearly every time I have passed the site of my fall since May, I did not utter the profane word I have uttered every other morning upon viewing the spot where I skidded across about five yards of crossing streetcar tracks and broken, pitted pavement on my left side. It felt pretty good. I enjoyed it. It felt... Normal. There have been a couple of bike crashes among my colleagues in the office recently, and I've heard comments about how dangerous biking is, or at least is seen as. Is it as dangerous as driving in a little metal box at 75 mph on a freeway? Is it as dangerous as eating the standard American diet? Is it as dangerous as not exercising and dying of preventable diseases caused by a sedentary lifestyle? My wonderful physical therapist, while helping me straighten out my arm completely for the first time since the surgery, pointed out that to live a healthy life you HAVE TO BE active, and that living in general entails risk. Crossing the street can risk your life! She advised me to walk defensively, and to bike defensively, but not to let fear stand between me and the activities that create good health. 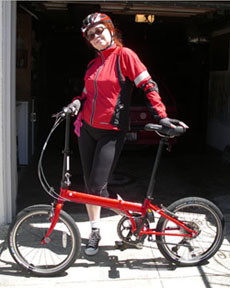 When I first bought my folding bike, I wrote in one of my journals that having a foldie would change my life - and I joked that I wasn't allowed to get hurt on it, because that wasn't what I meant. I did get hurt, and it changed the way I think about all kinds of things. But I am extremely, extremely happy to be biking again. The City is mine again.